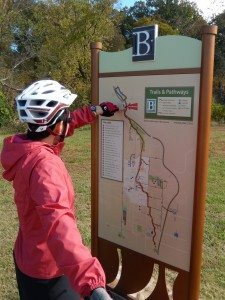 Alta Wayfinding Designer Karen Vitkay joined a national group of experts for this American Trails webinar on March 19. The program provided trail and greenway planners, designers, and managers with a practical understanding of trail/ped/bike wayfinding and informational systems with an emphasis on in-the-field structures and media. Elements addressed included: directional and locational; use and access; safety and regulatory and related systems including branding elements. Communicate the role of these systems, the hierarchy of elements, and methods for effective implementation and upkeep including in-house and contracted services and materials. Bob Searns is the Owner of The Greenway Team, out of Littleton, CO, and is the Emeritus Chair of the American Trails Board. Bob is a greenways and trails planner/developer. Over a four decade career, he has helped plan and develop a number of paddleways and urban white water boating solutions. Karen Vitkay is a Registered Landscape Architect with Alta Planning + Design in their Portland, Oregon office. She has focused on bicycle, pedestrian, and trail planning and design for the last ten years and currently leads Alta’s national wayfinding practice. Karen balances design creativity with an understanding of federal guidelines and standards, to achieve designs that are implementable as well as community supported.